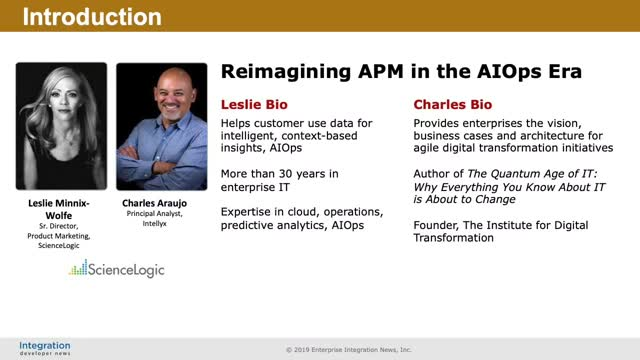 Listen to Charles Araujo, Principal Analyst with Intellyx, and Leslie Minnix-Wolfe, Senior Director of Product Marketing with ScienceLogic as they explore the evolution of APM and how it relates to the simultaneous transformation of IT operations — what some call AIOps. In this webinar, experts will discuss the current state of AI / ML for IT Operations and explore five steps needed for a successful transition to AIOps (Aritificial Intelligence for IT Operations). Additionally, we will demonstrate several use cases that show how the highly dynamic IT landscape of containers, clouds and serverless compute can be managed effectively at machine speed. With the right plan in place, organizations can utilize AIOps to navigate through large-scale digital transformation, and achieve true agility within IT. Join us for the upcoming webinar and learn the five essential steps to successfully deploying AIOps. IT organizations spend up to 60 hours per week reconciling data from different sources to keep CMDBs current. Even then, CMDBs are still not timely or accurate. Automating IT processes provides the speed and reliability required to support today’s digital business. ScienceLogic’s Automation Engine for AIOps provides modern IT operations with actionable, context-based insights to resolve and predict problems faster in a digital, ephemeral world. Learn how the ScienceLogic SL1 platform sees everything across cloud and distributed architectures, contextualizes data through relationship mapping, and acts on this insight through integration and automation. Watch a live demo and hear real-world examples that highlight the importance of context in deriving maximum value out of your IT operational data and delivering better outcomes for your business.